Home General Articles IBS and Emergency Situations: Can Medical IDs Help? 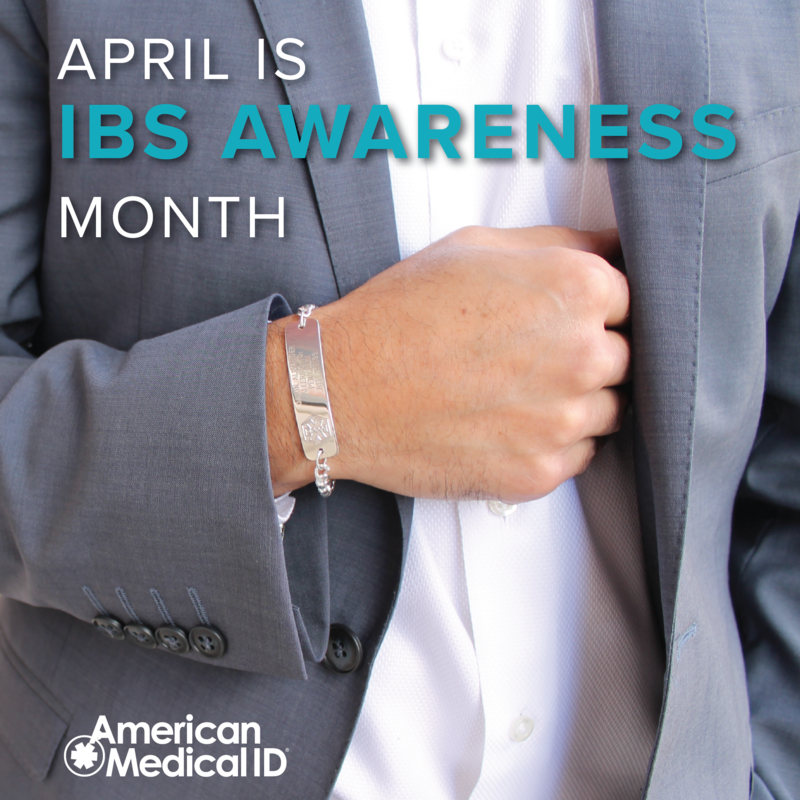 Since 1997, April has been designated as a special month for Irritable Bowel Syndrome (IBS) awareness. According to the International Foundation for Functional Gastrointestinal Disorders, IBS affects up to 1 in 7 Americans. It is estimated that up to 45 million people in the US are affected by this chronic medical condition. Irritable Bowel Syndrome is a common but serious intestinal disorder. People living with IBS experience pain in the belly, gas, diarrhea, and constipation. People who are old or young, male or female, can be diagnosed with IBS. People living with IBS can find themselves in an emergency situation for extreme symptoms. This can include severe stomach pain, colon spasms, and nausea. Severe IBS attacks can also cause a person to faint or pass out. “When the pain gets to a certain level (like a 50 on a scale of 1 to 10) the world goes gray, then black, and I pass out. I’ve fainted in mid-stride trying to make it to the bathroom and come to on the floor”, shares Heather, Administrator of the IBS Message Boards. Depending on severity, IBS symptoms can be managed by over-the-counter or prescription drugs such as antidepressants that can help block pain signals and antispasmodics. Side effects of these medications may include nausea, fatigue, drowsiness, and blurred vision. IBS patients want to know if wearing a medical alert bracelet can help. In the event of a serious flare-up where a person can faint, black out, or lose consciousness, a medical ID can alert first responders of important information such as having IBS and who to contact in case of an emergency. A medical ID can also contain other conditions that may or may not be related to IBS such as an allergy and if taking prescription meds. Access to this information can lead to timely and accurate diagnosis in an emergency in that symptoms can easily be identified to having IBS. In an article, Dr. Barbara Polen, PHD writes that people who have IBS often fear that their health concerns are minimized by emergency room personnel since IBS is not viewed as a “serious” health problem. This study shows that patients with IBS have to deal with the stigma surrounding this disease. One way to overcome these challenges is to communicate the seriousness of IBS. Presenting one’s medical information, history, and physician’s contact details can help IBS patients in self-advocacy and to receive the proper care and attention that they deserve. Do you or a loved one wear a medical ID for IBS? Let us know via comments below or if you have tips on dealing with emergency situations caused by an IBS flare up or attack. awareness month, ibs, irritable bowel syndrome, medical emergency, medical ID, medical ID bracelet. Bookmark.